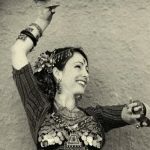 Barbara started her Tribal Bellydance training in 2003 with Stephanie Barto in Chicago, and was a member of Read my Hips, from 2005-2006. Back In Brazil, she started teaching Tribal Fusion classes in Porto Alegre, from 2006-2009. After moving to a different city and a lot o soul searching, she came back to the roots, and finished the ATS@ Teacher Training in 2015. Now she is back in Porto Alegre, teaching and performing ATS@ with her group collaboration Duna Tribal and her student troupe Trelissa.